Last week we visited White Oak Pastures, Will Harris’ fourth-generation farm in Bluffton, Georgia. Will raises cattle, sheep, goats, chickens turkeys, and geese. In the near future he plans to add rabbits and hogs as well. The farm is exemplary in terms of both land stewardship and humane animal handling. 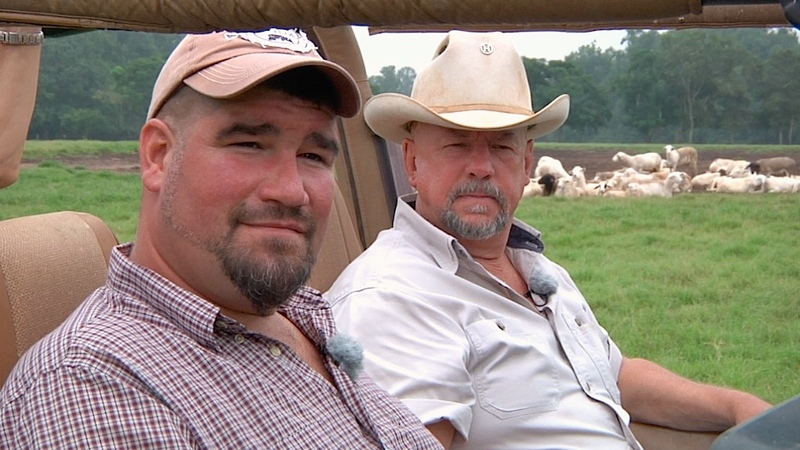 This 2,500 acre farm is the largest organic farm in Georgia and the only farm in the United States that has both a beef and chicken abattoir on the property. Will’s farming methods are based on pasture rotation modeled after the natural animal migration patterns in the Serengeti Plains of Africa. 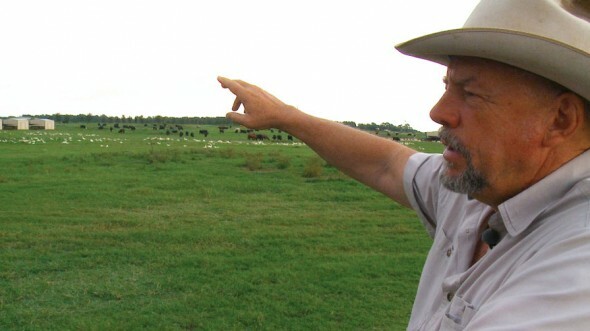 At White Oak Pastures the cows graze the grass, the sheep eat the weeds, and the chickens peck at the grubs and insects. All the species naturally fertilize the land and participate in a sustainable and symbiotic ecological cycle. ￼As Will explained to us, he strives to work with nature, rather than working against nature and trying to outwit nature. He says, “Nature produces no waste,” quoting George Washington Carver. 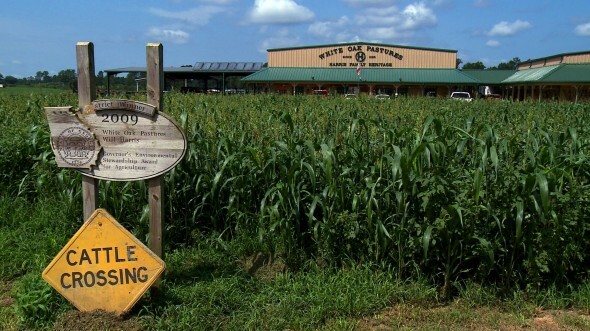 On White Oak Pastures all of the fertilizers for the organic crops are made right on the farm from the natural byproducts of raising and slaughtering animals. 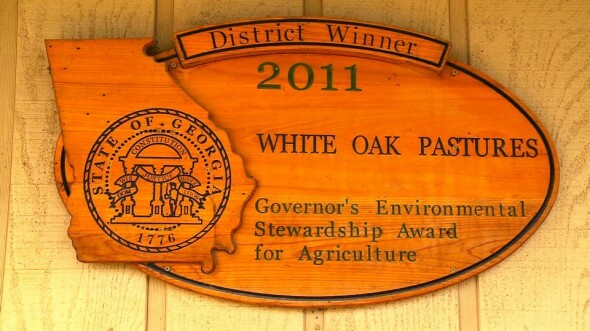 It’s no wonder that White Oak Pastures received the Governor’s Environmental Stewardship Award for Agriculture from the State of Georgia in 2011. Given all of Will’s efforts toward sustainability, in addition to recycling each plant and animal byproduct on the farm, White Oak Pastures has its own water treatment plant that reuses the wash down water from the abattoirs to irrigate the crops. A 50,000 watt solar voltaic array is used to heat the water in the abattoirs and provides some of the electricity to power the processing plant. 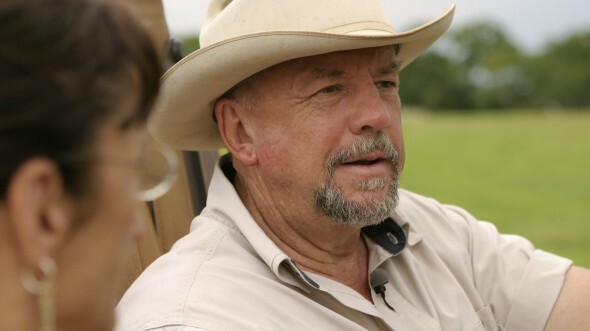 As Will drove us around his lush, green pastures in his Jeep, he told us passionately that he’s “a land steward and a herdsman.” We saw how respectful he is when it comes to the animals. At one point in our day he carefully picked up a laying hen and handed it to Audrey, who was excited and tentative at the same time. Will pointed out that the more organic a farm becomes, the more flora and fauna you will have on the farm. 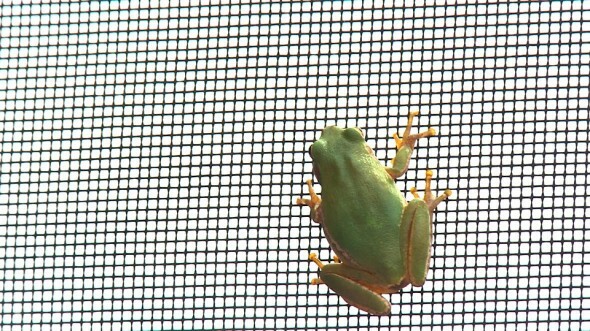 This frog we came across was described as “a good sign” by Will. He said that when he quit using pesticides, one of the surprises was that species of plants and animals that he remembered as a kid, came back. 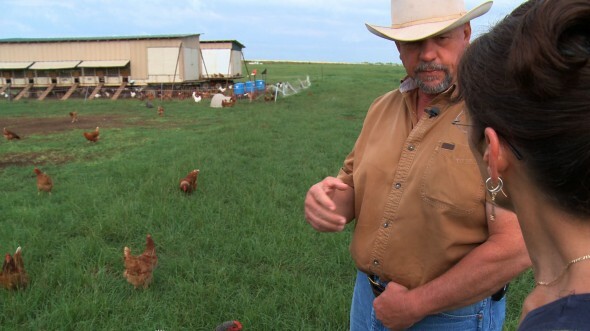 Every day, as he transformed his farm to an organic system, he saw something new that he remembered from forty years ago. Insects, too, are a special part of Will’s polyculture. This multiple-species habitat, in perfect balance with nature, makes the farm thrive in a way that monoculture farms controlled with pesticides and herbicides cannot. Will showed us how dung beetles dig down 18 inches to lay their eggs. Dung beetles, that help the decomposition of animal manure around the world, consume large amounts of dung as adults and larvae. They reduce pasture fouling, add nutrients to the soil, aerate the soil, and compete for nesting habitat and food resources with flies (particularly the face fly and the horn fly). 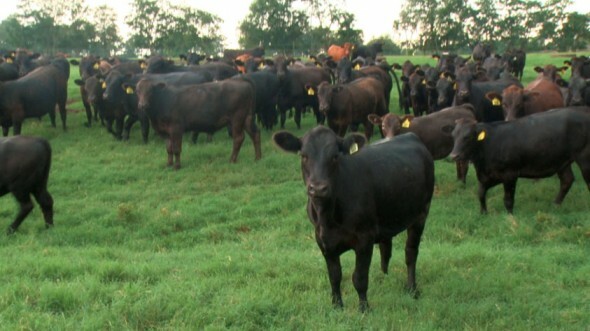 Face flies can irritate cattle to the point that they lose weight from not wanting to graze. 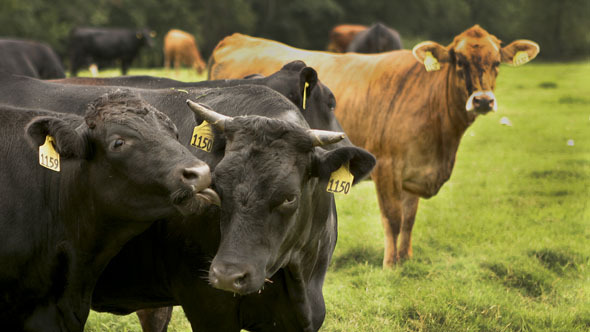 Horn flies can cause painful bleeding sores, also causing cattle to not want to eat. We’ve seen a lot of cattle over the past two years of filming, and have never seen such a large herd at this time of year without faces full of flies! We got to see the cattle (and, of course, all of the other animals) up close and personal. Will explained that all of his animals have no idea that a human being is capable of hurting them. They’ve never been hurt by a person and so they are all so trusting. ￼The end product of all of the efforts at White Oak Pastures with the animals is, of course, meat. 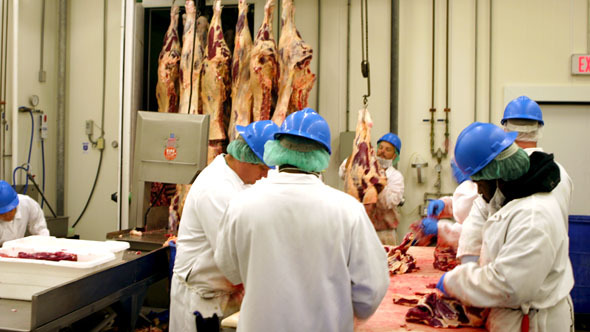 The handling of meat as it is being cut from carcasses at this well-managed and pristine cutting and packing room is a sight that people are familiar with from trips to the local supermarket. 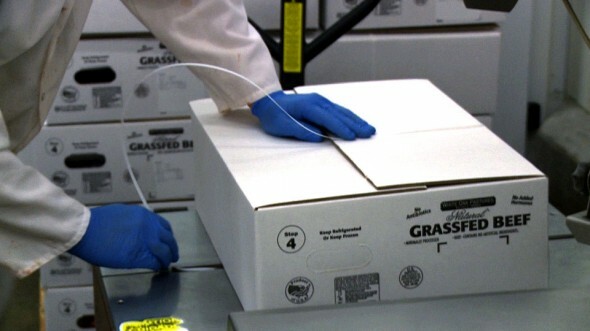 ￼Before meat is packaged into a box like the one above, which in this case would be destined for Whole Foods Markets, the animals need to be humanely slaughtered in a USDA-inspected abattoir. Both of Will’s abattoirs, one for chicken and the other for beef, were designed by Dr. Temple Grandin, a highly respected advocate for humane handling and slaughter of farm animals for the past twenty years. 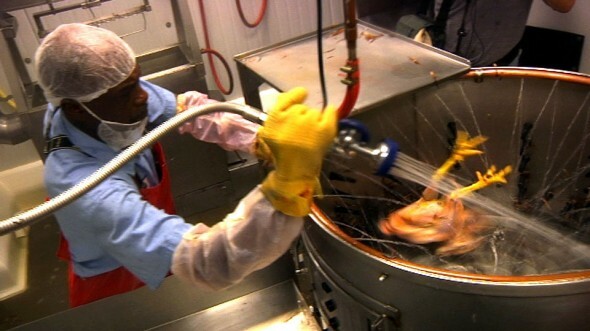 Will, a true spokesperson for transparency when it comes to understanding where meat comes from and how it is processed, let us see and film in both processing plants. Will showed us the chicken abattoir. This facility is state-of-the-art for humane handling and slaughter. Although poultry is excluded from the Humane Methods of Slaughter Act in the United States, and it is therefore not mandatory for them to be rendered unconscious by stunning before ￼being cut to bleed out, White Oak Pastures skillfully stuns each bird with an electrical stunning knife so it will not feel any pain. The lights are kept low in this section of the abattoir in order to keep the chickens calm. 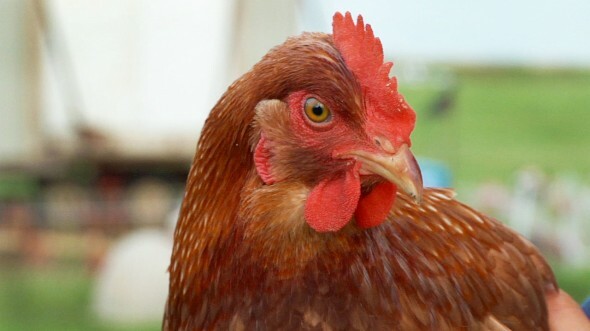 The manner in which they slaughter and process chickens at White Oak Pastures has earned their chicken a Step 5 rating from Global Animal Partnership. Another important part of humane animal handling is the transport, unloading, and holding pen areas. 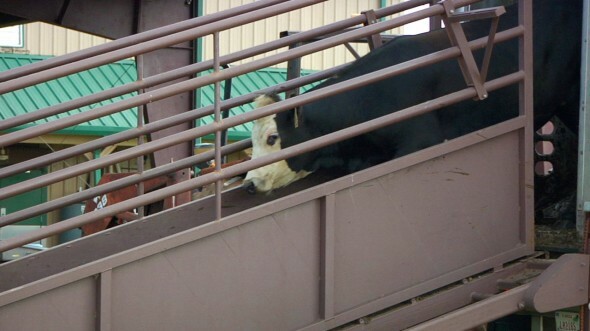 As part of Dr. Temple Grandin’s design, this unloading ramp and holding pen for cattle assured that the animals stayed calm throughout the process. The chutes that lead from the holding pen to the kill floor inside, also designed by Dr. Temple Grandin, keep the cattle from being afraid of outside distractions with the high walls. 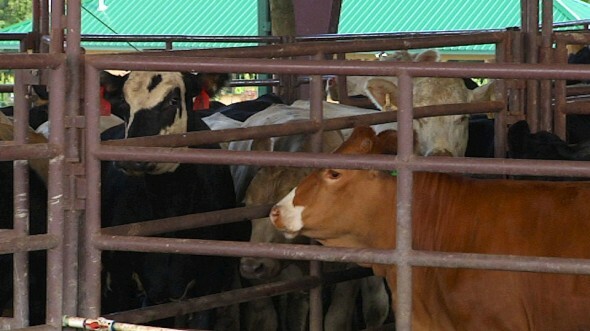 The workers were all gentle in coaxing the cattle through the chute. 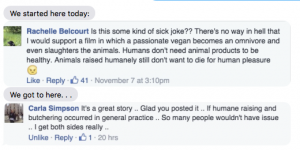 Dr. Temple Grandin says “We’ve go to give animals a decent life, and when it’s time to die, a painless death. And we’ve got to give them a life that’s worth living.” Will Harris stays true to these humane standards every step of the way. This is just one of the many reasons that all of the meat from White Oak Pastures is approved by Certified Humane and Animal Welfare Approved. It is also part of Global Animal Partnership’s 5-Step Animal Welfare Rating Standards program. When we saw the kill floor in the beef processing plant, Will carefully explained all of the details of both food safety and humane slaughter. Getting a better understanding of how slaughter is done here and being able to see the process first-hand, illuminates how Will respects the animals. 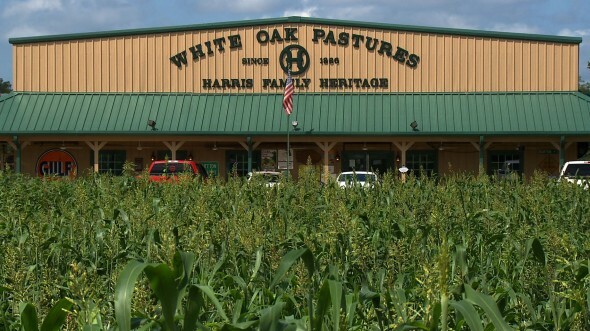 This respect, as we learned throughout our time at White Oak Pastures, reveals the special character of White Oak Pastures and everyone working there. ￼During lunch time we joined Will and his workers at the Pavilion, where employees are served a hot lunch consisting of fresh vegetables and beef or chicken which was raised and processed on the farm. 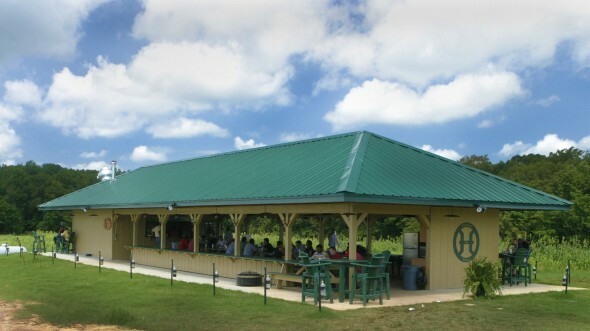 Your plate can’t get much closer to the pasture than having lunch at the White Oak Pastures pavilion, and true to their corporate ethos, regardless of whether you’re a manager or entry-level worker, everyone waits their turn in line for lunch. In every way, White Oak Pastures provides a living example of the future of sustainable agriculture, humane animal handling, and positive work environments, all components of an integrated whole, bringing us back to harmony with nature.